Greeting. After several months studying Joseph, we’re going to now move to the book of James and walk through the amazing truth found there. James starts off with a greeting. He explains who he is and who he’s addressing. Read James 1:1. It’s interesting how James describes himself. He is a bond-servant of God and of the Lord Jesus Christ. He recognized that is where his identity is. He could have indicated that he was the half-brother of Jesus. For some people, that might have made a difference, but he didn’t list that. James recognized that his whole identity is about who he is “in” Christ, not who he is “alongside” Christ. 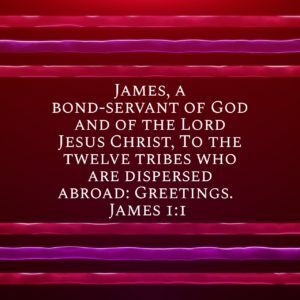 To truly embrace the gospel, James had to give up thinking that his physical relationship to Jesus had mattered and realize that it was only about his spiritual relationship with Him. Being the half-brother of Jesus didn’t give him any prestige, for at the end, it only really mattered who James is “in” Jesus Christ. Who are we in Jesus Christ? Has He come and saved us and changed us and can we describe ourselves as bond-servants of Christ? If not, then we need to reevaluate how we are relating to Jesus.